Mallard D-100 -- Dokkens Deadfowl Trainer Duck . $24.99. 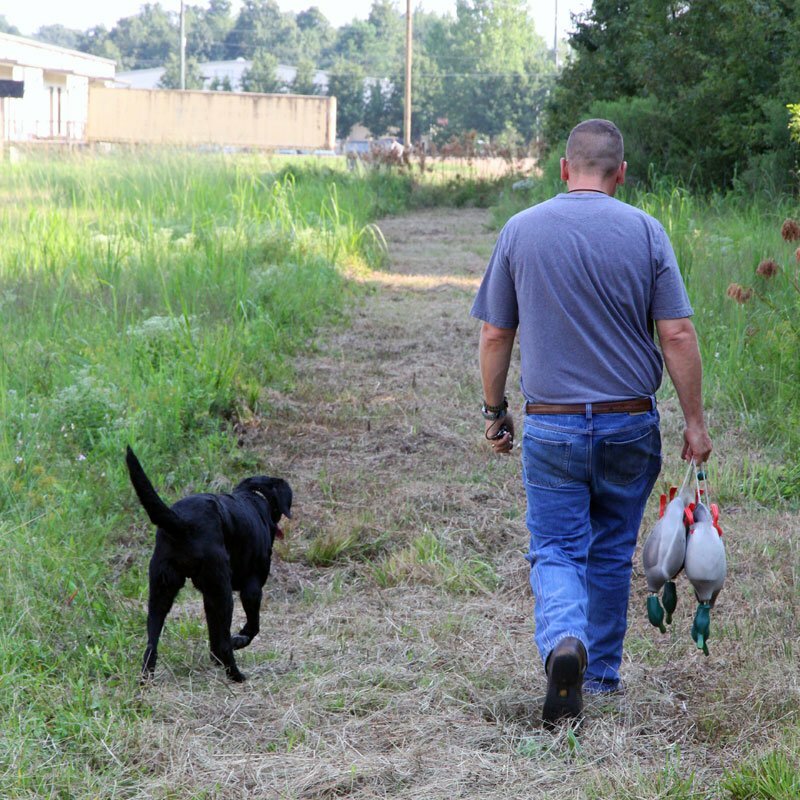 Tom Dokken's Dead Fowl Trainer may be one of the best tools ever designed for training retrievers. Once my pups get old enough to carry them, I switch over to them for the majority of their work. While you can't substitute using real ducks, the Dokken Ducks allow you to train with the natural weight and feel of a dead bird all the time. It can make a huge difference in your dog's attitude over time. My labs absolutely love them! This is a Dokken dead fowl mallard. This is one of my favorite products that we sell. 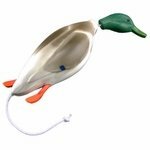 Designed by Tom Dokken, this is the closest you can get to a real duck for your dog to retrieve. Dead fowl trainers are made of a foam that has the weight and the feel of a dead duck. It is designed for your dog to have the correct hold on a bird. The dead fowl trainer has a hard head, has a foam body, has hard feet, and then the throw rope is included and it actually passes through the body. It's the same rope that attaches the head, so real secure. The design with this, because of the foam, you can actually inject scent straight into the body. It's just designed to teach that dog to go for the middle of the bird. You will find, too, that if you have a dog that shakes, if he shakes the head is designed to actually give him a small correction. So it will stop dogs from shaking birds. Just a really neat device. This is a great tool. It's a great way for your dog to get used to picking up birds. We start dogs on them as young as four or five months with the smaller teal, then we move them up to the mallard. Just a really great product. My dogs absolutely love them. We occasionally run across a dog that once you move over to dead fowl trainers, they don't like to go back to dummies. They only want to pick up these and they want to pick up birds. "Best training tool in the bag." Best training tool in the bag. Just got it today, and it just amazing. I have a 1 year old black lab that is hyper and very active. She didn't like retrieving bumpers, so I bought this and very happy. Also, Tom Dokken is my favorite dog trainer. If you have a retriever or just a dog that likes to play fetch, buy this. No regrets whatsoever. Plus they have fast shipping. "The dog loves it! 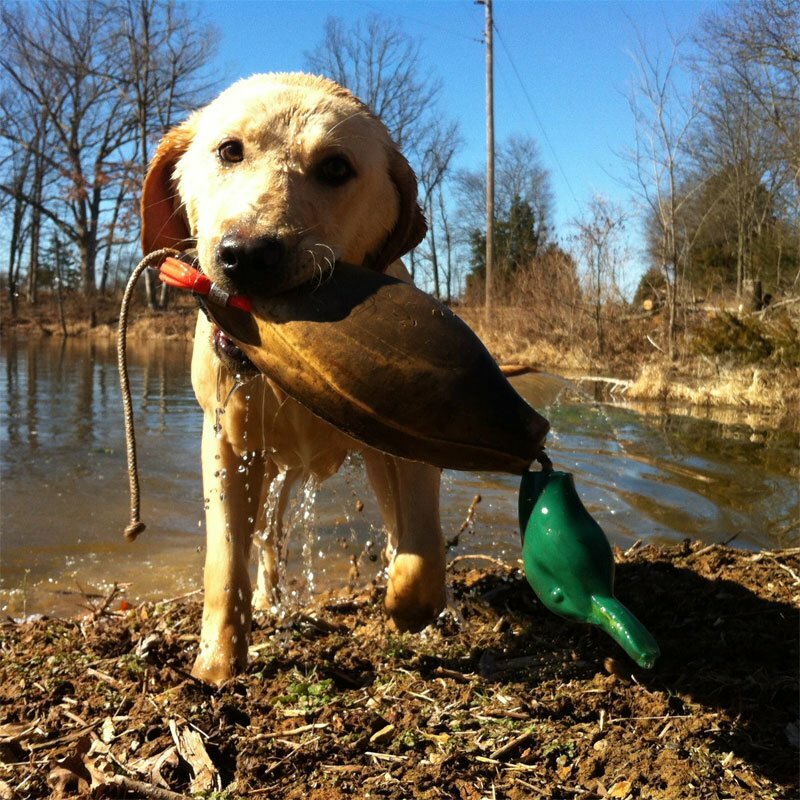 it is his favorite retrieving item"
"The Dokken is a very versatile and awesome training tool. It floats, and works awesome on land. Far better than bumpers and many other toys." The Dokken is a very versatile and awesome training tool. It floats, and works awesome on land. I originally picked up 2 from a local store, and then ordered 5 more from GDS, as they are the dog specialist. These are excellent for training my 5 month old and durable as heck, so if you get a tug of war, nothing happens to the bird, and I can use to train in water and dry land. Far better than bumpers and many other toys. "Simulates the size of a duck and teaches the dog to open its mouth wider, instilling muscle memory." Bumpers are good for training, but the dokken simulates the size of a duck and teaches the dog to open its mouth wider, instilling muscle memory. I like them a lot. "Exactly what my younger dog needed to get used to picking up and holding bigger birds"
This dummy is exactly what my younger dog needed to get used to picking up and holding bigger birds. Of all the money I've spent so far, I believe this was the best $25 spent!! "I had the most wonderful experience when my master threw the Mallard the first time for me, and everytime after." I had the most wonderful experience when my master threw the Mallard the first time for me, and everytime after. His wife took pictures that hit the internet with accolades from all. Thank you for a great fun and educational product, and I can't wait until we are out again running. Maybe someday we will go hunting to use the skills I will learn from the Dokken Mallard. My Lab Dolly absolutely loves her mallard, as well as her pheasant dummy Dokkens. From a pup, she has been somewhat indifferent when it comes to dummies, much preferring the real thing. But she has taken to these dead fowl trainers with enthusiasm, retrieving them on the run and delivering to hand. I highly recommend them!! "He responds really well to the trainer duck." Working with a new dog. Trainer duck works great, allowing me to really see how Jake handles a duck. He responds really well to the trainer duck. "I found that my dog likes the dead fowl trainer more than the traditional bumpers"
I found that my dog likes the dead fowl trainer more than the traditional bumpers. He rips after them and holds them longer than the canvas bumpers. I bought 4 of the dead fowl training bumpers for the advanced training at a later date. "Great tool for teaching young pups how to pick up and hold a big duck"
Great tool for teaching young pups how to pick up and hold a big duck. The hard plastic head forces the dog to grab the dummy correctly, and prevents shaking. My nine month old, black lab Kahle will now only retrieve a dokken dead fowl dummy, or a real bird. "When I threw the other brands he wasn't excited, but when I threw the Dokken he jumped into another gear." When I first started using the Dokken dummies my dog acted like they were the real thing. When I threw the other brands he wasn't excited, but when I threw the Dokken he jumped into another gear. I finally bought all Dokken's, and he is excited about every fetch. "No complaints on the product"
Waiting for pup to grow into this one. No complaints on the product. They work great. Use them for marks and blinds. "My Lab, Abby, loves the duck!" My Lab, Abby, loves the duck! She is a started retriever and loves to retrieve, run and swim. This picture looks just like her with her duck dummy. "Well made, and she took right to it." Well made, and she took right to it. She is 5 months old, so the large full size is about a month away from being the correct size. Dokken makes a mini mallard for smaller breeds. Excellent as advertised. Great training aid. Delivered very quickly as well. "Really gets my dog fired up for training." Really gets my dog fired up for training. 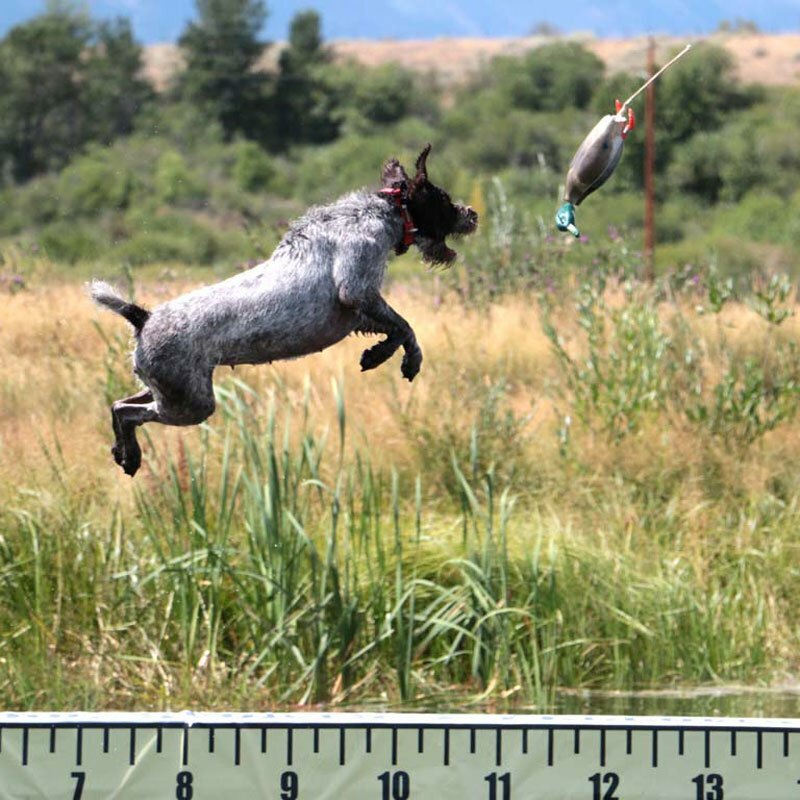 "This product really does help with teaching your dog a real retrieve." This product really does help with teaching your dog a real retrieve. Made well and I believe a must for anyone wanting to help your dog go to the next level in retrieving. "Thanks again. She LOVES IT." Even though I have a mixed breed of lab and pitbull, I really don't use her for hunting, mostly pet. She loves the water and will do anything for the down duck, and also a stick in the water, but sometime could not see it and swim around in circles. But with the duck floating above water she can see it, and its soft body she loves. Thanks again. She LOVES IT. "Finn enjoys the mallard, as well as the wood duck"
Finn enjoys the mallard, as well as the wood duck. Perfect transition from the teal he wore out in his first year. Dog loves it. Her trainer would let her have a few retrieves with the Dokken when she did well for a treat. I was amazed how it looks like a mallard on the ground and the feel. "It's holding up remarkably well"
Gracie loves what we now call "thatdamnduck." It's her favorite lake toy. It's holding up remarkably well, too, given that we use it as a toy and not for training. Thanks! "I like everything about this training tool." Standard Poodle. Hunts. Family pet. I like everything about this training tool. It is rugged enough to have survived a few winters of training, it holds scent very well. Most importantly it is large enough so a dog will not bite down hard, thus helping if you have a pup with a strong mouth. "My girls leap further off the dock when I use this training duck." golden retrievers. Family pet. Competes. We discovered Dock Diving this summer. My girls leap further off the dock when I use this training duck. So, I should say THEY give the Mallard Duck 5 stars! "Bought two and I wish I bought four." Dogs with hard mouths can puncture the foam. Outside of that it bought two and I wish I bought four. "All around good training tool for my lab"
My Lab and Vizsla both love it, and it is durable. What a great product. If I could own 100 of these and never use another type of retrieving dummy again I would. I love the Dokken whether it's training for hunt tests or waterfowl season. Can't get much closer to a real duck than this, I recommend buying the scent injection kit for added realism. "Would be nice if it had a ball on the rope"
Would be nice if it had a ball on the rope. Would make it easier to throw. 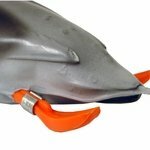 What a great product if I could own 100 of these and never use another type of retrieving dummy again I would. I love the dokken weather it's training for hunt tests or waterfowl season can't get much closer to a real duck than this I recommend buying the scent injection kit for added realism. "Gun Dog Supply is number ONE." Gun Dog Supply is number ONE. If you want cute camo shirts, go to Gander or Cabelas. If you need dog supplies, the only place is GUN DOG SUPPLY! "It really helps my dog enjoy retrieving while hunting." This is a great product! It really helps my dog enjoy retrieving while hunting. I really like this. I will probably be in the market for a pheasant and dove version soon. How about a sale on these. I can buy them locally for the same price, but I would buy them from you again,...the sale would encourage me to do it sooner rather than later. "I will be happy to rate it once I have tried it." Haven't tried the product yet. Will not receive it before Dec. 20, when it will be transported to Norway! I will be happy to rate it once I have tried it. Dokken dead fowl dummies are great training tools. "Great product and fast shipping"
"It is a little much for her, but the pheasant is perfect." She is a small lab about 60 lbs. It is a little much for her, but the pheasant is perfect. "Dogs love it. It seem to really turn on their instinct." Dogs love it. It seem to really turn on their instinct. "Tough and durable. Very good piece of training equipment." Tough and durable. Very good piece of training equipment. "At first I thought it would be too large for her to retrieve and run with, but oh no!!!! She loves her duckie!!!" At first I thought it would be too large for her to retrieve and run with, but oh no!!!! She loves her duckie!!! Great product. The way better than stick shape duck! I'll recommend to all my hunting body. 5 star. Perfect mallard size. Teaches them to pick it up by the body. "Training with these Dokken training ducks is a great substitute." Living In Las Vegas, NV, access to any live fowl to train my Flatcoats is very rare. Training with these Dokken training ducks is a great substitute. "My dog loves retrieving it." Nice mallard dummy. My dog loves retrieving it. "I like the dokkens for training and use them in my mini z's." I like the dokkens for training and use them in my mini z's. I cut the attached throw rope off the ones I use in the wingers and the teal and dove dikkens to keep puppies and young dogs from trying to carry them by the tail. Good product. I use them for my wingers, and they are great. Great training aid. Floats high, realistic weight, and heavy enough to throw. Extremely durable. My dog loves it. Only downside is when you use it in water it takes a while to dry out. Not really a big deal, I just hang it on my fence to dry. "My dog loves it. I own three dead fowl trainers, and we love them all." I bought this to add to my training routine. I only hunted upland last year and decided I was going to do waterfowl in the upcoming season, so I wanted a trainer that looked like the real thing. It works great. My dog loves it. I own three dead fowl trainers, and we love them all. "I thought the mallard might be a challenge for my ess, but he loves it." I thought the mallard might be a challenge for my ess, but he loves it. He runs harder and with more excitement when working with the dokken compared to other dummies. I love it. The dog loves it! What more can I say. "Great product as always from Dokken." Great product as always from Dokken. Product was as expected. Unfortunately my dog likes to destroy his toys. I got this trainer duck specifically as a toy, and he's already chewed some of the foam rubber off the tail end. I guess I should have expected that. Really like the duck though. This thing is awesome! My dog would retrieve anything I threw, but he LOVES this thing. In fact, he starts jumping in the kennel when he sees me grab it. One of the best purchases I've made for my dog! Great product. The dogs go nuts when I bring this out. Will definitely be ordering a few more for when I start training doubles. 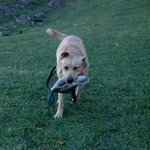 "Great product for retriever training"
Great product for retriever training. "Everything I ordered from Gun Dog Supply works as it should"
Everything I ordered from Gun Dog Supply works as it should. Customer service was great, fast order process, and extremely fast shipping. Thank you. Dogs love it too. They stopped shaking the dummies as advertised. Deutsch Drahthaar & Weimeraner. Hunts. Works great. My 5 month old Chesapeake already handles this well. "It teaches her to properly hold a bird, and she loves it!" I love this Dokken. I injected it with the duck scent to make it a more realistic training tool for my Golden Retriever. It teaches her to properly hold a bird, and she loves it! "This is a really good training tool." This is a really good training tool. My Labs really get excited about the Dokken products. It is also very durable, and I can inject it with scent. Very good product. Now I will purchase the goose as well. "Getting our 4 month old pup ready for duck season"
Thank you. Getting our 4 month old pup ready for duck season. 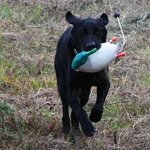 "Great training dummies for retrievers"
Great training dummies for retrievers. 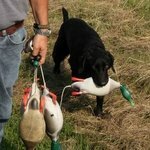 "Very good aid in getting him ready to carry and hold larger ducks"
correction for swinging dummy on return. The head is attached by what seems like a continuation of the cord through the body of the duck. Multiple throws and the duck is still intact. The "detached" head prevents my dog from shaking the duck after retrival. The body is soft and doesn't get chewed up after training. Recommended highly. "Nellie rates it 6 stars! ; )"
Super Smart Black Lab. Family pet. "Love these!! I have 3 of them, and they hold up very well!" "She loves it, and it's holding up to her abuse well"
Some scent with it would have been nice. Had a little trouble finding some, other than that it's great. She loves it, and it's holding up to her abuse well. "My pup is five months old now so the mallards a little big." My pup is five months old now so the mallards a little big. He's using the teal dead fowl trainer. And we will move him up to the Mallard when he gets bigger. Excellent size and weight. Great for off-season training. "So far we've enjoyed it!" So far we've enjoyed it! Best trainers on the market! Very pleased with quality! 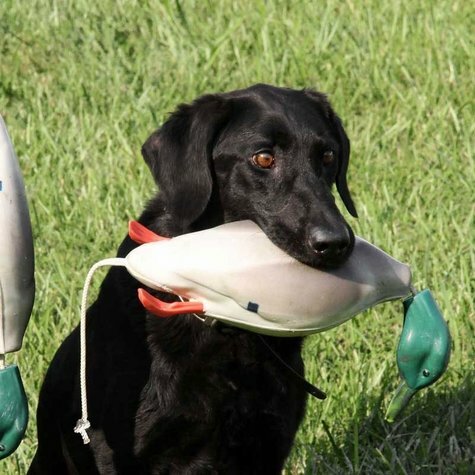 "The training duck is perfect for a young or old dog during training sessions." The training duck is perfect for a young or old dog during training sessions. It's the correct size and texture for a dog to get accustom to for retrieving larger ducks. We really like these! We start all of our young dogs on them. Puppies have no problem with them, they are light, soft without being too soft and the color makes them easy for us to spot. Great product! I don't have anything negative to say about them. "very durable, great training device, dogs love it"
"The product works as claimed." With the first retrieve of the duck after mostly canvas dummy work my lab tried to pick up the doken duck at a couple of places and quickly found the spot. No hesitations after that. The product works as claimed. Chesapeakes. Hunts. Family pet. Competes. Great product for training. I use them for blind work and multiple land/water marks throwing them from a Zinger Winger. Great training tool. a little story: while training one day, a friend's labrador decided to retrieve the dummy instead of his normal canvas fetch toy. When he returned, he didn't want to give up the doken and took it into the truck with him where he hid it in the back seat. When someone came around, he would pick up his doken and place it further away from the tail gate as possible until finally he dropped it in his master's seat. He didn't want anyone to take it away from him! The funny part is that his master didn't think he would even like the doken because of the weight. 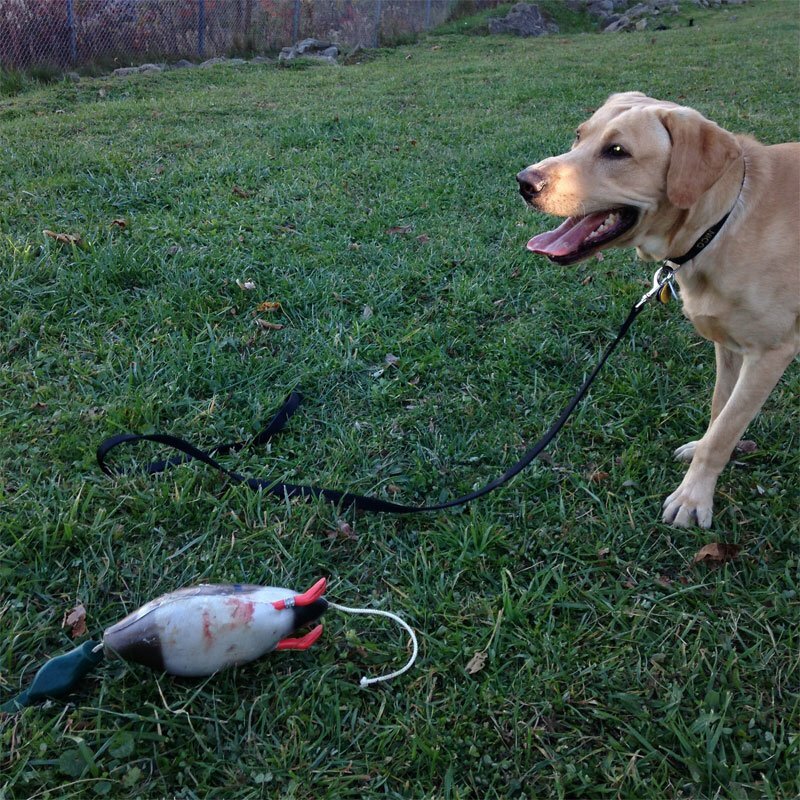 This dog has never experienced ducks or dokens before and now it's his favorite retrieving tool! Chesapeak Bay Ret. Hunts. Family pet. Competes. I train with the dokken on marks, water and for blinds, also used for play time. Very sturdy. "Durable. Effective training tool when real ducks are unavailable." Durable. Effective training tool when real ducks are unavailable. Wish that the red knobs on the rope were standard. "Great dummy. realistic and incredibly durable." Great dummy. realistic and incredibly durable. holds sent well and throws great for those trainers who have to train by themselves. "Its time for me to order some more. Great job Steve!!!" Great training tool, helps them get the feel of a real flopping duck in their mouth. If I were to say there was a downside was the head was to heavy and to hard. after a while they get tired of it hitting them in the face and want to start picking it up by the head. Other than that it gets a thumbs up from me. Its time for me to order some more. Great job Steve!!! "Durable, realistic weight and shape"
Also have a Dokken Deadfowl pheasant dummy - I use it in conjunction with pheasant scent for training. Works great - really sharpens my dogs tracking and scenting skills in the off season. "I would recommend your products"
The water toys I bought, dummies and the Dokken dummy are holding up well, I have to tell you, I am not training water fowl retrievers, I have two lab mixes that are maniacs and one got hurt on a stick, (bad throat injury, she's OK now) so at swim time no more sticks! The dummies are a perfect substitute and are very durable. The Dokken dummy still floats, but "Puppy" took a big hunk out of it. I guess hunting retrievers don't get that rough. GERMAN WIRE HAIRED POINTING GRIFFON. Hunts. Family pet. "Excellent product and same with order and shipping process." Excellent product and same with order and shipping process. Looking at some new items and will be shopping soon. Thanks again for your wonderful service. 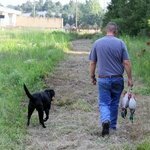 "Most realistic waterfowl training dummy I've ever used." Most realistic waterfowl training dummy I've ever used. The injectable scent and weighted-head features of the dummy quickly teach a young dog not only to retrieve a duck but also the best way to carry it. Love our Dokken dummy, and have found it to be a very effective training tool. Still holding up. Great product. "It is a good training tool for water work." The Dokken Deadfowl duck dummy looks real floating in the water. It is a good training tool for water work. "I love my Deadfowl Duck dummy." Holding up great! even in the very cold winter months. "Loves to retrieve these out of the pool. " "When you are out of birds, this is best. " Love Dokkens when you are out of birds this is best. Or dogs not ready for birds. "Soft body encourages proper hold, and my dog seems to really enjoy retrieving it over the standard cylinder dummies." Soft body encourages proper hold, and my dog seems to really enjoy retrieving it over the standard cylinder dummies. I've owed many of these, and the only down sides are, they are easy to destroy if you forget to put it away and your dog gets to play with them, and they can pick up some pretty bad smell if you use it in a body of water that isn't so clean, like at a dog park. "Gets used almost every day in the summer." This is my second Dokken duck. I lost the first one after 7 years so I needed a replacement. It gets used almost every day in the summer. "Dogs seem to prefer them (and are more driven to retrieve them) over bumpers." Irish water spaniel,labrador. Family pet. Competes. The dogs seem to prefer them (and are more driven to retrieve them) over bumpers. English Springer Spanual. Hunts. Family pet. The dummy has held up real well. "Excellent training tool, feel helps with a soft mouth." Excellent training tool, feel help with a soft mouth. Max has learned to retrieve year round, he will do want ever it takes to get his Dokken Deadfowl duck dummy. This has reinforced his field retrieves. I would recommend this dummy, after two years of use it is still going strong. Time to get Max a Dokken Deadfowl goose dummy for fall. "By the way, y'all are the best online dog supply store there is." I like this retriever dummy a lot. One thing I might add is that the foam part had some indentions on it that looked like it had been handled roughly. Not that it had been used or anything, just weird marks from the manufacturer. I hadn't seen these marks on Dokken's in the store (Academy and Bass Pro Shops) but they are holding up good, so it does not bother me anymore. By the way, y'all are the best online dog supply store there is. I ONLY shop with y'all. "Great product have used it for years"
Great product have used it for years, has held up real well. Very durable and unsinkable!! Great product. Hope to do more business with you in the future.
" It is a great tool"
"Very good have been using hard for over a year." "My dummy is still going strong!!!" My dummy is still going strong!!! Great item. Am in the process of training our first hunting Golden Retriever and this is an invaluable tool for teaching hold, land and water retrieves, give, etc. The ball for the end is a must add so you can get some distance when throwing. 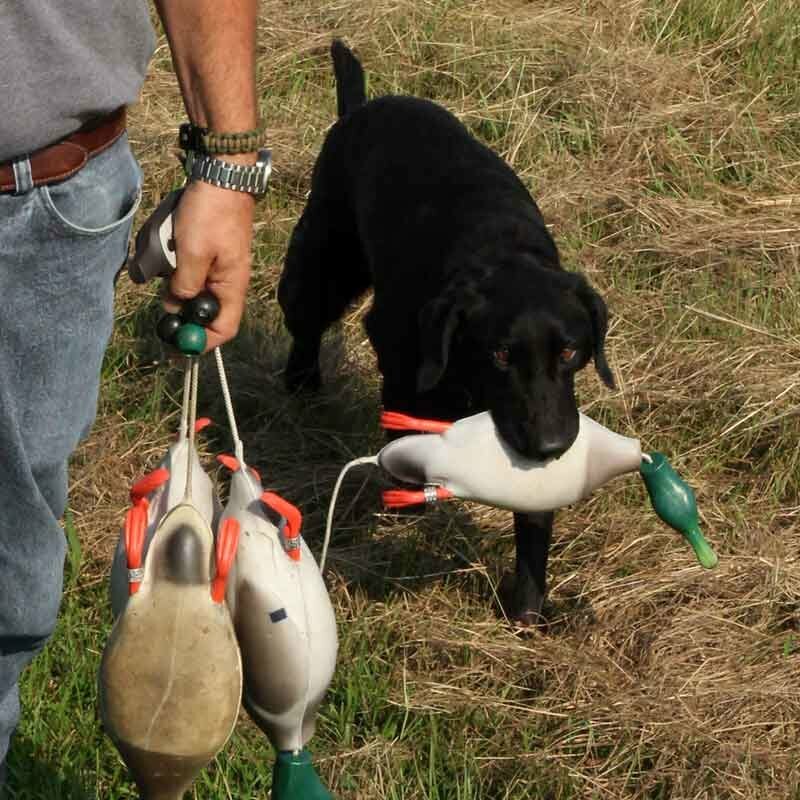 The solid head and ball help keep the dog from shaking off and getting you all wet at the end of the retrieve as well. Solidly built, great price and quick ship from Steve!! Great for trainning and retrieving. Dogs just love it. The string dosen't last that long with excessive use, but great product. "These Bumper's are very durable"
These Bumper's are very durable, visible, affordable and small enuff for a puppy to retrieve without any complication! ! I had never used them until my puppies trainer turned me on to them and I will use these from now on! "My dog loves this training tool." My dog loves this training tool. The only issue I've had with this product is with the durability of the plastic bits breaking off (feet). Other than that it's great. "Excellent product. Wouldn't train without one." "They hold up extremely well." Very durable. I train two out of every three days so they get a lot of use. I currently have about twelve assorted duck and one big Canada goose dokkens. I also train with a group often and use my equipment. They hold up extremely well. The only negative I have is a lot of the heads have broken, but it doesn't effect the use of the product. "This duck goes everywhere with us. " She loves it as always. Keeps her very engaged in her swimming exercise. Thanks to this thing, which I replace every year or two, she doesn't even look at tennis balls anymore. This duck goes everywhere with us. Everyone knows she carries it in the truck and it's always around for tossing. It holds up very well; shipping was fast; and your price is always way better than retail. Thanks. "It's construction is well done, we use this every day through out the summer." This dummy is perfect for what I use it for. The weight is very very close to what our birds around here weigh, so the dog is ready for anything I can knock out of the sky. It's construction is well done, we use this every day through out the summer and is not the worse for wear. Holding up fantastically. Even with puppies using them. great training tool. MSU BULLDOGS! "I wish they were less expensive so i could own a few more." I wish they were less expensive so i could own a few more. "I have had over two years and still in good shape"
"Great for training in water situations, shooting over pups." Great for training in water situations, shooting over pups. "Soft enough for dog to get a good grip but this tends to make them less durable." Soft enough for dog to get a good grip but this tends to make them less durable. 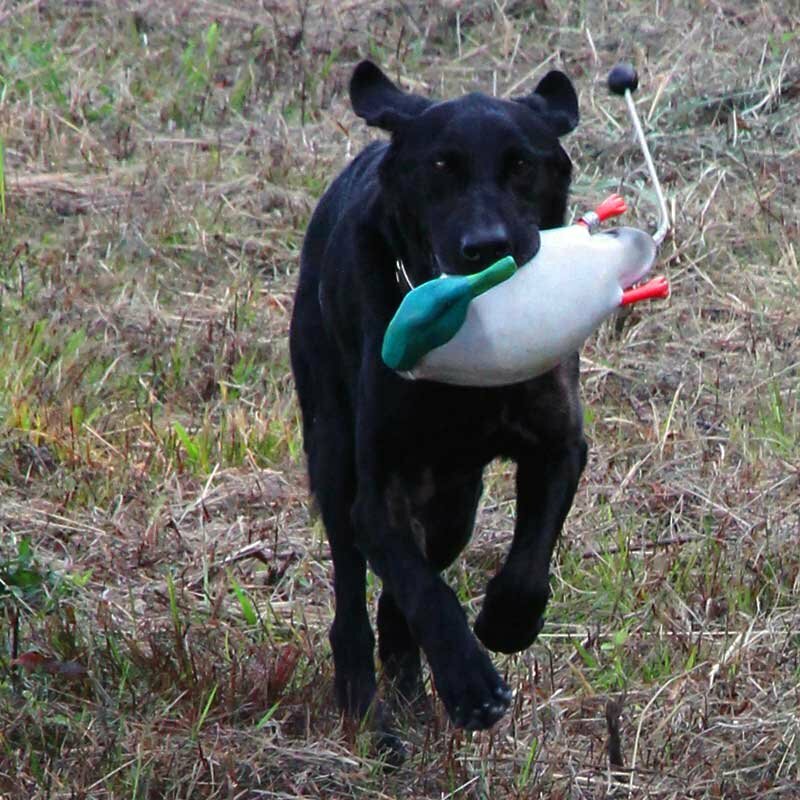 "The Dokken is also the best transition to real birds that I have found in training." I have been pleased with my Dokken. It has survived many years and several dogs through their formal retriever training. It has especially help with one of my dogs that had a hard time picking up large hard bumpers, he was more receptive to training with the Dokken. The Dokken is also the best transition to real birds that I have found in training. "Both my dogs think the Dokken is the best thing going!!" Flat-coats. Hunts. Family pet. Competes. Both my dogs think the Dokken is the best thing going!! They get pretty worked up over training bumpers but if they see the dokken come out...you would think it was the real thing. Any concepts that require some extra motivation, bring out the dokken. A big reward in their books. We have had Dokkens in the past and have lost some but we have never worn one out!! "We love the collar we bought"
We love the collar we bought, and Guinness seemed to be very comfortable with it. Since she is a chocolate lab, the collar helps us to see her when we walk her in the evening. "Sure got my pup ready to handle the size of real ducks. " I wish you didn't have to buy the knob at the end to make it easier to throw. Seems like "ease of throw" should be standard, not optional. 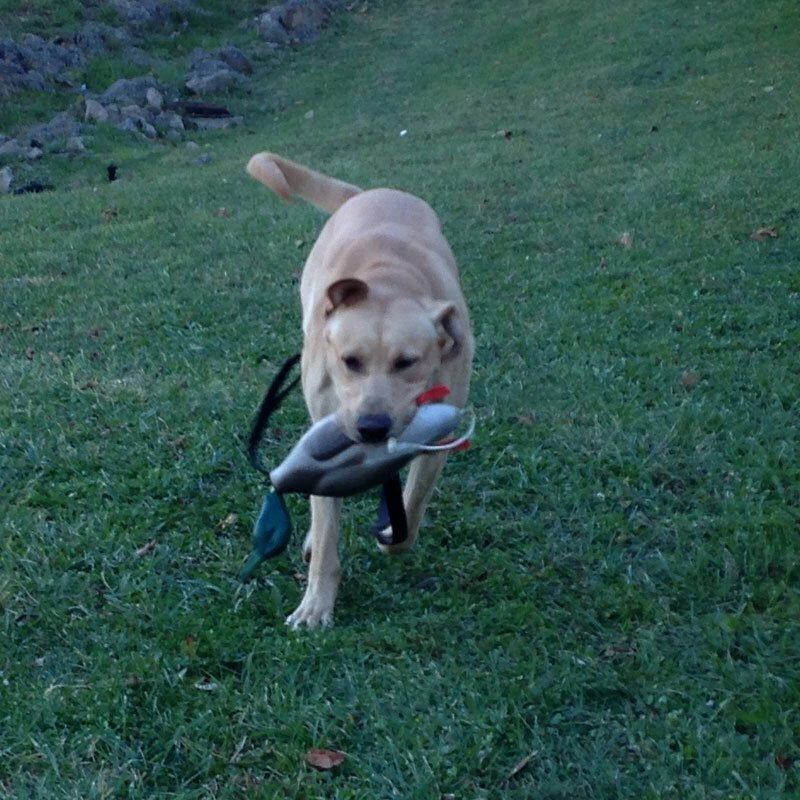 On the other hand, it sure got my pup ready to handle the size of real ducks when the season rolled around. Works well. Would be 5 stars if throw rope was larger in diameter at least 3/8 inch rope. Otherwise, good product. "Works well to keep your dog from shaking the ducks"
"Helps to prevent the dog from head whipping the duck. Easy to apply scent to. " 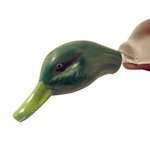 Realistic weight and floating dummy, has a hard plastic head separate from the body which help to prevent the dog from head whipping the duck,and it is easy to apply scent to. Only complaint is the small rope with small knot that really tears your fingers up when using it a lot. "Dokkens make it easier to transition to real birds." Lab Retriever. Hunts. Family pet. Competes. I have Dokkens from teal to goose. I like to introduce puppies to the shape, weight and feel of the birds. Dokkens make it easier to transition to real birds. I have noticed that my oldest Dokkens have slightly discolored, getting darker. I don\'t know if this was due to sun exposure or from aging of the foam. The units I have are all still very usable. "Life size replica, dogs favorite thing to retrieve"
Chesapeake bay retreiver. Hunts. Family pet. "It's holding up quite well." It's holding up quite well. We've done over 200 water and 50+ rough field retrieves. Other than some teeth puncture wounds and it taking on a little water through absorption, it's good. I'll buy another another one coming up, maybe the goose this time. "Pretty easy for the dog to leave teeth marks." Pretty easy for the dog to leave teeth marks. I know they are supposed to have a soft mouth but my year old pup liked to shake it around a bit. "I am still using some from 3 years ago." lab,pointer. Hunts. Family pet. Competes. I like the Dokken overall. It will get a funky odor at times if left out in the elements. Seems to come about when doing more water work, The material is good and they last as long as any other dead duck bumper I have used. They are great coming out of wingers. 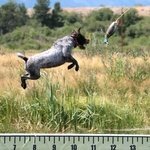 I even use the little teal and quail out of box launchers when training my pointers. I am still using some from 3 years ago. "At one practice hunt we tossed the dummy it hit the side of the bank (muddy, not hard) and the head of the duck split." The plastic head. At one practice hunt we tossed the dummy it hit the side of the bank (muddy, not hard) and the head of the duck split. Very disappointed in that. It was so sharp on the edges I haven't used it since. Otherwise the body and weight is great. "It's firm like a natural duck"
It's firm like a natural duck, and the loose head does stop head shaking. "I use this dead duck as a lure for dock jumping"
I use this dead duck as a lure for dock jumping -- Ultimate Air Dog competitions and practice. "Best alternative to real ducks. Light weight so pups can carry easily." My Dokken has held up well under repeated use. The best alternative to real ducks. Light weight so pups can carry easily. Works as advertised, definitely keeps dog's interest for training sessions. Tip of bill broke off, but everything else has held up, used in water and field. After a few months of using the dokken regularly, both on land and water, it has held up quite well. The foam body has a few scuffs, and minimal tooth marks (thank god for a non-hard-mouth dog). My only two gripes thus far are that it would have been nice if these came with the throw ball (similar to how GDS provides a throw rope with all their plastic bumpers), and also that the body gets dirt and grass stained very easily. Aside from those two relatively minor issues, this is a pretty good product for keeping your dog trained on size and weight of a real bird, when real birds are hard to come by. I'd buy another! Good so far. Haven't had it long enough to comment on durability yet. Good for training. Dogs like it. "Has held up to date." Has held up to date. "The head was advertised that it will correct a dog for shaking. It does not appear that it would"
The head was advertised that it will correct a dog for shaking. It does not appear that it would, although my dog does not need the correction. "The dog really likes the duck." I bought the duck as a toy for our EOD dog to use in the pool we have set up. The dog really likes the duck and the pool and so far the duck has held up well over the last few months. "Seems like it is very durable." Gives the dog a more life like feel. It's good for a change. Seems like it is very durable. "A rubber head would be much more durable….."
I have 7 dokkens. I have broken the heads on 2. I was loading them in the truck and dropped them on the concrete drive and they broke right behind the eyes on both. A rubber head would be much more durable…..
"One of our dokkens rolled onto the floor in the house, and the head split in half." One of our dokkens rolled onto the floor in the house, and the head split in half. The dogs don't seem to notice, so we go ahead and use it! Some of the dokkens that other members of our golden retriever club have used for years are beginning to have pieces come out of the rubber bodies from where the dogs bite down on them as they are retrieving. I'm not talking about chewing up the dokkens, just regular use. I like the bumper. I just wish it came with a black throwing knob. Very good product. I like the weight of the dummys,very easy to throw out at a good a distance.I used the smaller one for pup training up to 1yr old, and now using the larger one. John. 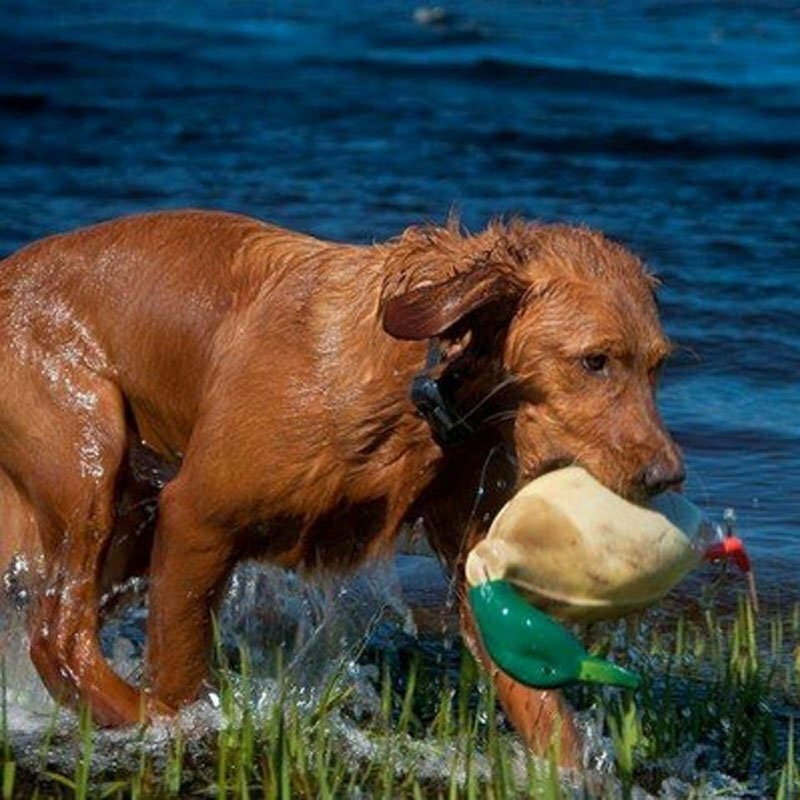 "Overall good product and very practical for retrievers." Labrador Retrievers. Hunts. Family pet. 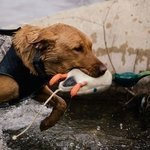 Overall good product and very practical for retrievers. The goose I have though is so heavy it's tough to throw any distance. The head fell off (rope came out of the head?). But one of my Labs goes nuts over the goose more than any of the ducks. I actually like the Avery ATB over the Dokken. Little more durable it seems and they don't get funky smelling over the years. "Wish they put the ez grip ball on earlier." Wish they put the ez grip ball on earlier. I like the somewhat realism of the dead fowl. The dogs seem to enjoy them a little more than bumpers. Very durable. "My Brit doesn't really like to rerieve the Duck. I'm not sure if it is too unrealistic or what. She will go for dead chuckers and even frozen birds"
My Brit doesn't really like to rerieve the Duck. I'm not sure if it is too unrealistic or what. She will go for dead chuckers and even frozen birds. Sorry I cant't give it a great review. I love everything else I have gotten from you. "Great for dry training... water training is not advised with this product, as the material absorbs alot of water and becomes water-logged." "After first couple retrieves, the body material was tearing." After first couple retrieves, the body material was tearing. "The dokken started out to be what I wanted/expected. Over time it has become water logged and heavy not to mention the head broke off." The dokken started out to be what I wanted/expected. Over time it has become water logged and heavy not to mention the head broke off. I've tried even standing on it to try and get the weight back down. That being said I still use it and if I'm doing pile work it is the first dummy the dogs will pick up over the canvas or knobby bumpers. Looks nice when new. Lightweight and easy to throw. After several retrieves gets waterlogged, heavy and difficult to throw. Step on it and water bubbles out. Played with it for a while and he has a soft mouth but it tended to get messed up too easy.. then wouldnt float well. Please note: power throw ball shown in some product photos sold separately.